what what? number one: One of the admins where I work came into our office to ask a question. Of all the ones I anticipated, I never expected, "Does that house across the street look like the one in Charmed?" what what? number two: Why is it that my own website comes up second in the search results for "Hall and Oates slash fanfic?" I don't have any. Hell, why am I even running a search on this in the first place? I must be really desperate for distraction from homework. On the left-hand sideblog, I've started posting fan-related links in their own section called the Fandom Bucket. That MP3 link is courtesy of Aquaman fan Laura - great find! Check out the other songs on Ookla the Mok's website. I respect any band that writes a song with the lyrics "Okay, you can call them graphic novels, but they’re still just plain old comic books to me, and I don’t see why you must always ceaselessly discuss the post-Zero hour continuity." 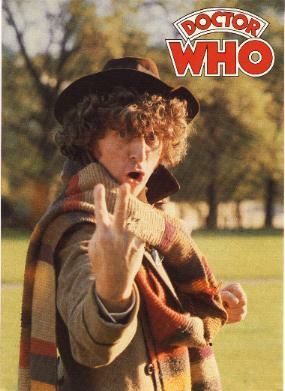 Tom Baker! Such a roguish cur!